Will members operate like at Creative Live where videos remain available (forever) even if one “opts-out”. i.e. If somebody paid membership for 2 years and opted – out they would still have access to that 2 years of videos that accumulated while they were members. Another situation is what if they come back a year or 2 later and are new members again? Masters Academy is membership whereas CreativeLIVE offers individual product purchases. Those are two fundamentally different ways of selling training. Masters Academy is a membership where you have access to everything I’ve created since starting the service, plus a new lesson every week for as long as your membership is active. If you let the membership lapse, then you can no longer access the videos. If you wait three years and then sign up again, you’d regain access to every lesson I’ve made since starting the service. I think my longest recent CreativeLIVE class had 24 lessons and was priced at $199. Masters Academy costs $107, already contains 24 lessons, and will continue to grow each week for as long as you’re a member. The idea is to give you all my training output at a single reasonable price instead of trying to constantly try to talk you into spending more $$. I chose this business model because it allows me to design something that can go well beyond what I’m able to accomplish in individual classes. Since I don’t have to start at the basics over and over again (like I do in almost every class on CL), I can dig deeper into topics and slowly push you to more advanced ideas. Ideas I never get to cover on CL because we always start basic and have a time limit. Thank you Ben. I signed up for a membership and am looking forward to the year of training. Love your teaching style. Super fantastic! You and Karen rock! Love you both from Day One! Judy, you’ve been one of my favorites since way early… I look back in the photos of my teaching and there you are… doesn’t matter how far I look back. THANK YOU for listening to be blab over and over again. I love what I do and you make it possible. Can members still ask questions? That interaction and access to Ben was the attractive aspect of the Facebook page. Won’t it be difficult to recreate the ease of communication FB has developed? We still have a members-only private Facebook group called the Masters Forum–that’s not going away. We just changed how members access videos and move them off Facebook. 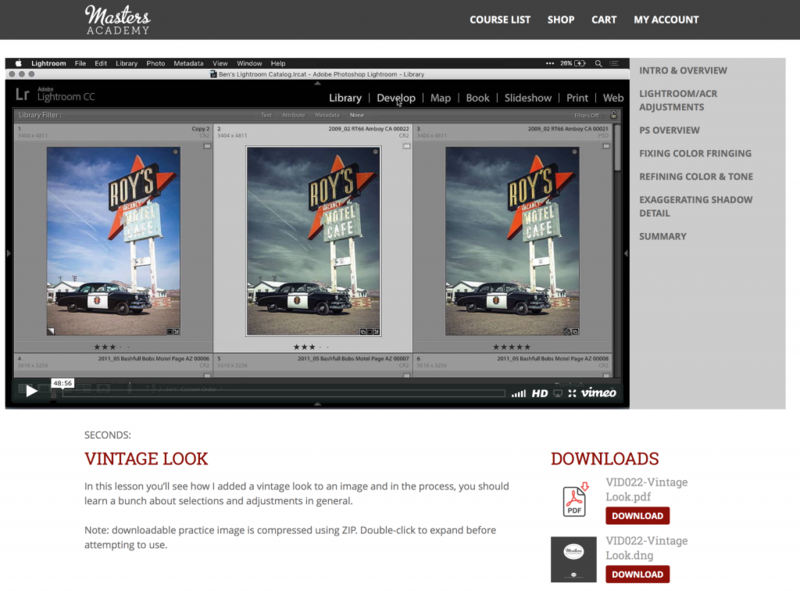 As a result they now feature a clickable table of contents, downloadable practice files and more. The Masters Forum on Facebook is where you can ask questions, post pictures and communicate will all the other members. Ben this sounds exciting indeed. I purchased your Lightroom Mastery: Keywords back when I purchased your Adobe® Lightroom® CC Photo Editing: The Complete Guide. I did manage to make a mess of my lightroom Catalog when I incorrectly imported the keywords. Still trying to sort it out. Has the Keywords been updated or any plans to update it? Thinking seriously about Masters Academy. Will I be able to get it later today for the $107. offer price? 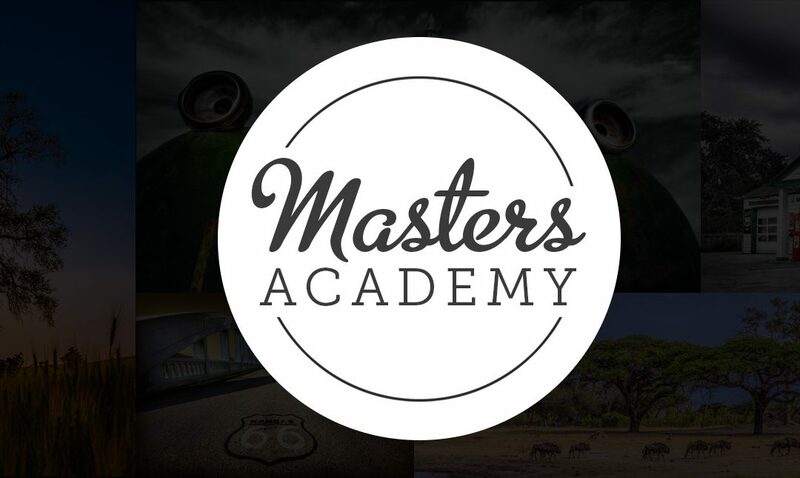 The price for a new Masters Academy membership will increase as we add more features and content. The price for continuing the yearly auto-renewing subscription stays the same and you can cancel the auto-renewal at any time. As long as you don’t allow the membership to lapse, then the renewal price will not increase over time. We did as a way of rewarding early adopters and long-term supporters. We increased the price last when we hit 250 members and plan to do so again once we reach 500 members. Last time I checked, we had 495+ members. But don’t worry, we always announce it ahead of time and give at least 48 hours notice before the price goes up. Sorry…replied above in the wrong place. Seniors moment :). Masters Academy have amazing learning quality with clear and precise instruction in Lightroom and Photoshop, and I’m pleased to see the added word, ‘photography’ above. Ben always come good on his promises. In addition, this is ongoing as well as up to date. Ben teaches us post production on the latest iteration of Lr and PS, from the basics to advanced techniques. If my comment looks as if I’m promoting Masters Academy, it is because I am. But I’m promoting it because it’s just true, not because I was asked to do it! Anyone who are wondering whether to take the plunge, you won’t regret it. It’s amazing value for your money! Am I glad I’m part of this! Thank you Ben and Karen! Thanks for being a long-term supporter. I hope you enjoy Masters Academy where we can build on all the things you learned in my CL classes. Thanks for the great improvements to Masters Academy, Ben. You and Karen rock! I have been taking your classes on CL and following you now for quite a few years. Best instructor I have taken programs from. Continued success with this endeavor. I look forward to your weekly videos.